The Colorado Rockies lost to the San Diego Padres Tuesday night, 4-3. The Rockies are now 68-56 on the season. The Padres jumped out to a quick 2-0 lead in the opening inning as Freddy Galvis started the game with a leadoff double and later scored on a two-run home run hit by first basemen Eric Hosmer. The Padres recorded back-to-back singles in the second inning and later scored a run when Galvis hit a sacrifice fly to center field, making the score 3-0. The Rockies managed to get on the scoreboard in the bottom of the third inning. Charlie Blackmon started the rally as he belted the first pitch in is at-bat down the right field line, legging out a triple with two-outs. Blackmon’s hustle paid dividends for Colorado as DJ LeMahieu followed him by hitting an infield single to the right side of the diamond, allowing Chuck to score and put the Rockies on the scoreboard. From there, All-Star Nolan Arenado blasted a double to deep center field, scoring LeMahieu to make the score 3-2. Colorado scored again in the bottom of the fifth inning where catcher Chris Iannetta hit a towering 400+ foot home run to left field to tie the game at three runs apiece. The score did not stay even for long as the Padres quickly answered in top of the sixth inning where Anderson coughed up his second home run of the game, a solo shot to Austin Hedges which put San Diego back on-top, 4-3. Anderson finished with a line of 6.1 innings pitched, allowing four runs on 10 hits while striking out eight batters. Anderson has surrendered 26 home runs this season, nine coming in his last four starts and is now tied for the most in the National League, according to Patrick Saunders of the Denver Post. 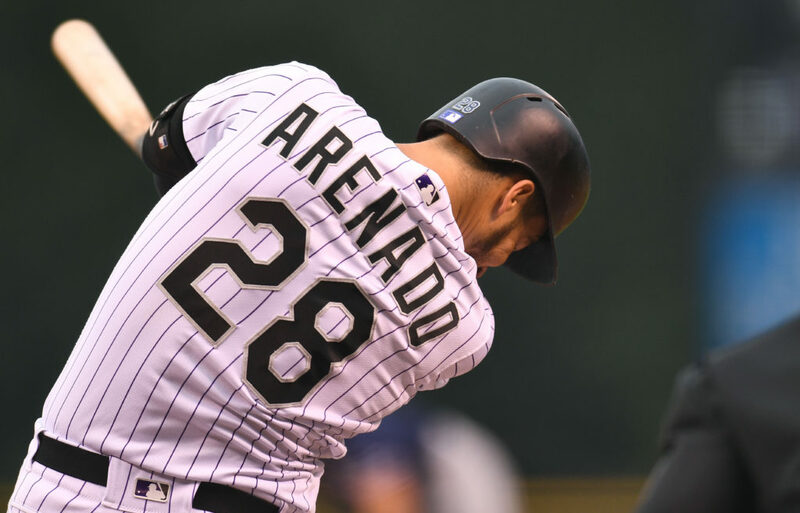 The Rockies did manage to put pressure on the Padres in the bottom of the eighth inning where Colorado worked themselves into a bases loaded situation with one out. With the bases juiced both Trevor Story and Carlos Gonzalez were unable to provide the Rockies’ with the clutch hit they were seeking, striking out and grounding out respectively. Chris Iannetta nearly tied the game in the bottom of the ninth inning by hitting a deep fly ball to the warning track in left field; however, the ball fell short of the fence and the Padres solidified the victory. The Rockies and Padres will continue their series from Coors Field Wednesday night with first pitch set for 6:40 MST.